A fast-casual restaurant with a concise and fully vegan menu opened over the weekend on Newbury Street. 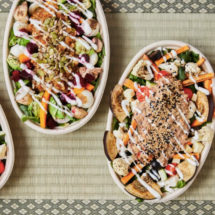 Red White Japanese Vegan (294 Newbury Street) serves a selection of bowls that start with a grain-and-greens base, and there are also smoothies and green teas. The restaurant comes to Boston from Japanese restaurateur Toc Kobayashi, who in recent years sold most of his restaurants in Japan to work towards developing Japanese restaurants in the U.S.
With Red White, Kobayashi and partner Keita Ueki — who serves as general manager and developed recipes for the restaurant — serve dishes with a base of grains and greens (such as a combination of white rice, mochi barley, broccoli, cauliflower, and sesame), topped with beans, tofu, and more. The sauce options include yuzu, spicy soy, cilantro and ginger, and more. In addition to the bowls, which can be made gluten-free by swapping the grain-and-greens base for greens alone, Red White offers smoothies and Japanese green teas. Bowls go for $12.95, while smoothies range in price from $7 to $9.50. In celebration of its opening, Red White will continue a buy-one-get-one meal deal through Monday, April 15. The restaurant operates seven days a week, from 10 a.m. to 8 p.m.